Six electronic massage chairs are arranged in a circle, facing inwards, as if for a meeting of a high council. 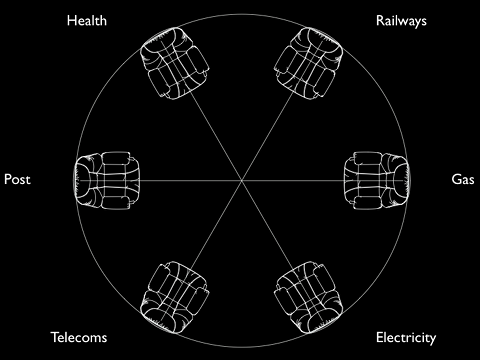 Each chair represents a key ‘public’ service or industry: Health, Railways, Gas, Electricity,Telecoms and Post. Illuminating the scene is a neon-style display, methodically scrolling through the dates from 1900 to the present, over the course of 15 minutes. The colour of the neon changes depending on which political party is in power at that time. During these 15 minutes the massage chairs switch on at the dates in which their corresponding service or industry was taken into public ownership and switch off again at the date when/if they were privatised. Take a seat... and relax.